Eggs boiled in onsen (japanese: hotspring), Nagano, Japan (Photo: Miya.m. Permission: GFDL, cc-by-sa-2.1-jp). 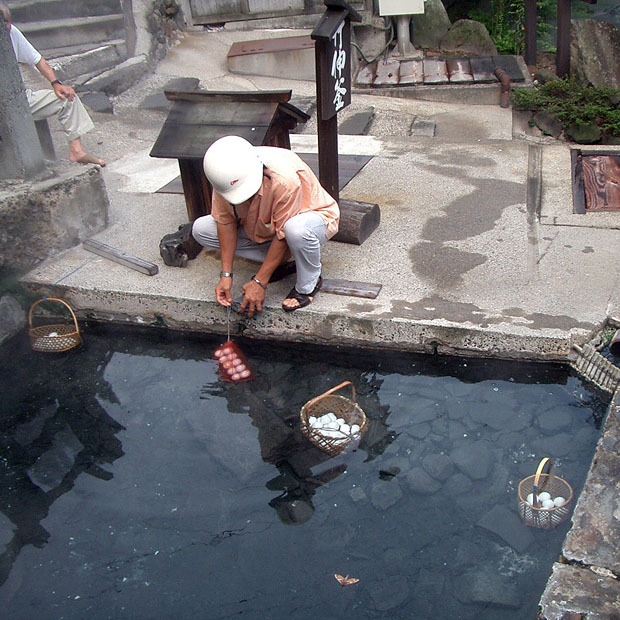 In Japan eggs cooked in hot springs (onsen) are known as onsen tamago. I’ve also read that MÄori women used boiling pools at Whakarewarewa to cook. In fact I wouldn’t be surprised if many people with access to hot springs would have considered using them for cooking. But finding examples isn’t so easy, so now I need your help: Are you aware of other examples of “natural sous vide”? By this I mean cooking of food at temperature below 100 °C/212 °F without the use of a temperature controlled water bath. It could be in a hot spring, near volcanoes, in steam baths or even in saunas (in a previous post on eggs I mentioned Finnish sauna eggs and Korean Maekbanseok gyeran). Any help finding other examples would be greatly appreciated! I’m interested in modern-day examples as well as traditional practices.